This is an old favourite of many people but at eatinbrixton we have only managed to have a takeaway so we decided to visit in person on a rainy tuesday evening. When we arrived it was completely empty except for the two waiters and so we got to view the interior of stylish leather covered chairs (very comfortable) and plain cream and mustard yellow relatively unadorned walls. The TV, which presumably is to keep the waiters happy, was muted and we were not drawn to the picture, even though it was Eastenders. The restaurant did fill up over the course of half an hour with people celebrating birthdays (the waiters happily took the birthday cake) and with people coming for a takeaway and the service was impeccable with everything coming reasonably quickly and without too much fuss and bother, or without feeling rushed. This is a well established restaurant which has a menu of Punjab and South Indian food which is “colour free”. We chose from the Khan’s specials, highly recommended part of the menu. But there was a lot to choose from with starters covering all the usual fare – meat and vegetable pakoras, puris and samosas, kebabs and obviously onion bhaji. We chose the prawn puri and vegetable pakora. Even then we hadn’t quite finished choosing as there were different vegetables to choose for the pakora.When the dishes arrived we knew at once we had overordered as they were certainly large enough to share….. and we had the main course coming too. Both dishes were a mix of heat and spice. The pakora also came with small tomotoes as a decoration and drops of a deep green highly flavoured coriander sauce. The dishes may not be quite hot enough for the most hardened chilli eater but they were just right for us. All came with three additional sauces, the yogourt one, the onions and mango chutney. All reasonably delicate so as not to overepower the flavours of the dishes. As well as the Khan’s specials there are also main courses from a varied menu such as smoky oven dishes like tandoori, different balti’s, biryani and the list goes on. There is also an extensive vegetarian menu. We chose butter chicken (for nostalgic reasons as we really liked this i eating this when we visited Delhi) and lamb pasanda with baingan aloo (aubergine with onions, tomoatoes and potato), plain rice and a nan. This may not have been the best choices to test differences as both main courses are in a thick creamy sauce and very delicate … i.e. not at all hot…… although the aubergine had a bit of a kick in it. The nan was puffed up and still smelt slightly like doughnuts do and the rice was as described aromatic. We washed the meal down with a mango and a salty lassi and a jug of plain tap water came to the table unbidden. We didn’t really notice that there was no alcohol being served. Then as people came in and put beer on the tables we read the notice on the outside of the restaurant (backwards) which said they were happy for alcohol to be brought in. The price of the meal was definitely in budget – £41.30 for two. We were delighted to have at last tasted a good indian meal in Brixton. In fact we are going to taste it again soon as we brought home the leftovers which makes it a budget meal, unless you were really hungry and scoffed the lot in one go. Next time we might be more adventurous with the heat, although this member of the eatinbrixton gang likes the delicacy of the flavours too. 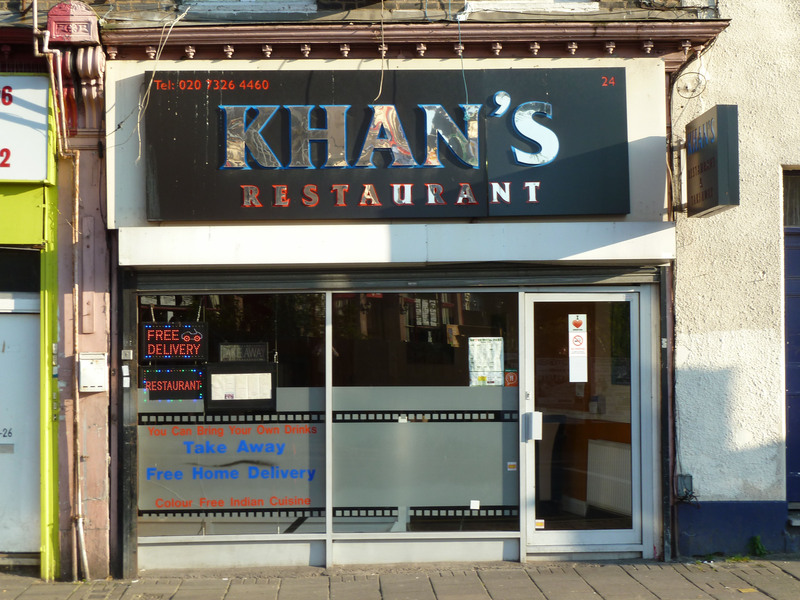 We now know why there are so many people in our neighbourhood who recommend Khan’s. We would too.